TOPIC 1: Faraday’s Law – How a generator works. A moving magnetic field through a coil induces a voltage in the conductor. Can the coil move and the magnetic field stand still? Nothing is perfect! Not all power generated is consumed in the load. 1. I2R Loss (Copper Loss) – All conductors have resistance and the power consumed in a resistor is P=I2R according to the Power Law (Watt’s Law). 2. Eddy Current Loss- Inside the rotating coils is a ferromagnetic core. For the same reason that current is induced in the conductors it is also induced in the core. 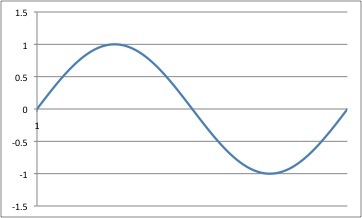 This current (eddy current) induced in the core flows in a complete circuit through the core and generates heat (loss). Eddy Currents are drastically reduced by “laminating” the core. A laminated core is simply a core made up of thin sheets of the material stacked upon one another and electrically insulated by a coat of varnish or similar thin material. 3. Hysteresis Loss – This is a type of magnetic memory in the core. Recall that generators must have a magnetic field moving relative to a coil. If there is a constant, non-changing, magnetic field inside the coil (a slightly magnetized core, from the previous magnetic field in the core) then the relative moving magnetic field is smaller due to the constant magnetic field present. This type of loss is combated by material selection of the core. Annealed silicon steel is a good choice. 1. Separately Excited (Permanent Magnet or DC current electromagnet) – The output voltage is dependent on the current flowing in the field winding and the speed of rotation of the machine. A higher current flow will yield a higher output voltage as will a higher rotational speed. 2. 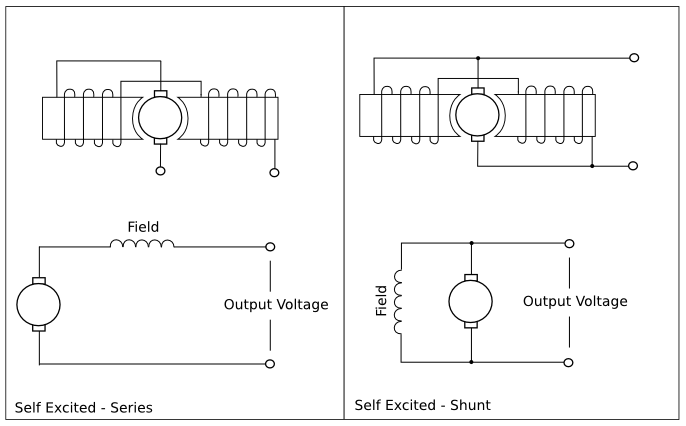 Self Excited – Shunt (Constant Voltage Generator) – This type of generator will produce a total current that is divided between the field winding and the load. The field current is relatively small when compared to the load current. This type yields a constant voltage at the output with a changing load. 3. Self Exited – Series – Because the armature and field windings are in series with the load they share the same current. This results in a changing voltage with a changing load. This type is only useful if the load remains constant during use or if widely varying voltages are acceptable to the load. 4. Self Exited – Compound – This style of generator puts part of the field winding in parallel with the armature and part of the field winding in series with the armature. Different ratios of the parts yield differently acting machines. In more complicated systems the ratios of the parts can be controlled electronically. Because a varying voltage is not ideal it is necessary to regulate the output voltage like your thermostat regulates the temperature in your home. Because the field current and rotational speed are the deciding factors we need to vary one or both of these automatically to get a constant voltage. This is typically done by controlling the field current with respect to the output voltage. This regulation is oftentimes mathematically defined more as a percentage of voltage drop from full load to no load. Rather than mathematically expressing how much regulation is being done by a control system it is common to express how much is left to go. The common equation is as follows. True or False? The frequency of the output of an AC generator depends on the rotational speed of the machine? Laminating the core of a generator is done to combat _____________. Which generator type offers the most constant output voltage without external control? A generator has a Full Load voltage of 165V. The information plate on that same motor states a regulation of 3%. To what voltage should you expect the output voltage to change to if the load was disconnected? 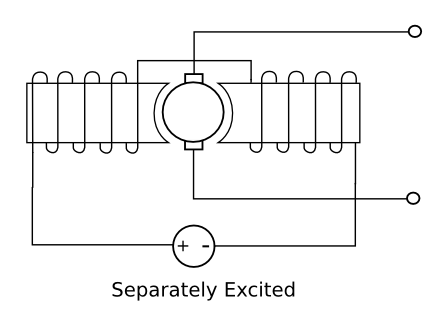 A self-excited series generator is capable of generating 100W of energy. 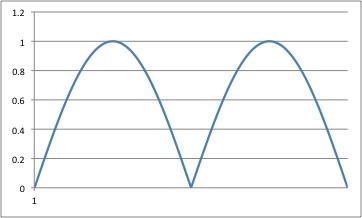 However, it is known to loose 5W due to hysteresis and 3W due to eddy currents. If the output current is 5A and the resistance of the windings together is 80 milliohms, what is the actual output power of the generator? Assume a purely resistive load. ____________ are used to transfer electricity from the armature to the load in an AC generator while __________ are used for the same purpose in a DC generator. What is the output voltage of a generator directly dependent upon? A self-excited shunt generator is delivering 490W of power to a load. The generator is capable of generating 500W of power and it is known that 3W of power are lost due to hysteresis. Assuming a purely resistive load, what percentage of the total power generated is converted to heat due to eddy currents if the winding resistance is measured to be 50 milliohms and the output current is measured at 8 amps. What mathematic equation[s] do you want us to use to find out 4,5 and 8? I don’t understand how to apply the given Regulation percentage equation to them if we are supposed to. For Number 4, the regulation equation should be used. You are given the percentage (3%) and the Full-Load Voltage (165). Solve that equation for the unkown, No-Load voltage and plug in the two given numbers to solve. For Number 5, We know the capable amount of power that the generator can generate. We also know that there are three things that reduce that capable number. These are Eddy Currents, Hysteresis, and Copper Losses. You are given two of them and must solve for the third using the given current and winding resistance. Finally, you must subtract the losses from the capable power to solve for the actual output. For Number 8, we can figure the total losses (500W-490W). To find the power lost due to Eddy currents we must find the other two losses and subtract them from the total loss. Then convert this to a percentage.